Setting up stage, originally uploaded by Thoroughly Good. There’s a large crown outside our bedroom window. It’s lifting all sorts of heavy looking items from large lorries parked below us across to the poolside. Lots of bronzed men busy themselves wheeling flight cases from here to there and back again. Inside, the hotel’s guest list has swelled considerably over the past 24 hours. The breakfast room is occupied by inconceivably handsome men with smouldering eyes and shaven faces accentuating chiselled jaws. I’m convinced they’re parading around just to irritate me as I devour my plate of cheese, salami and salad for breakfast. The twenty-something females aren’t that much better either. They float around the corridors and restaurant, dressed in billowy-white tops. Pouting lips adorn otherwise expressionless faces decked out with designer sunglasses. 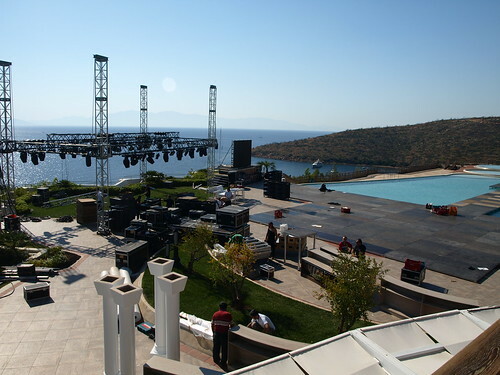 The tanned glamorous set is here at the Kempinski for what I’m told is a Turkish celebrity wedding this weekend. Suddenly I feel really awkwardly British and also fuelled by curiosity all at the same time. Unfortunately, whilst my investigations have been productive I am unable to reveal the name of the groom (or the bride, for that matter). This isn’t because I’m not allowed to (although judging by the way the security glared at me when I took the picture above, I imagine there would be one or two furrowed brows if I did mention the names of the couple). Part of the reason I can’t reveal the name is because I’ve only heard it once. Was it Volkon somebody? Turkish names are phenomenally hard to recall or pronounce or even spell. I won’t even try. Would hate to humiliate myself more than necessary. What I am certain of is that the groom is a hotel owner from nearby Bodrum and that he is of sufficient standing to attract a great many glamorous individuals on yachts to come to his event and most importantly one of Turkey’s greatest pop stars, a man called Kenan Dogulu. Shamefully, I drew a complete blank when the waiter down by the beach bar handed back my notebook with the name of the artist written on it for me. Any Eurovision fans who are reading this (there aren’t that many, I’m sure, even less now) will know that Kenan Dogulu represented Turkey in the 2007 Eurovision with his song Shake it Up. (On reflection, maybe this wasn’t quite as embarrassing as I first thought. The waiter had no idea who Sertab Erener was which is surprising in the grand scheme of things considering she actually won the damn contest for Turkey in 2003). Judging by the considerable size of the outdoor stage being constructed by the pool and that a day before the nuptials the infinity pool has been partialled covered by a temporary catwalk (I’m presuming its for Kenan to sing and gyrate on rather than some kind of impromptu fashion show) that Kenan is still really quite successful despite his Eurovision appearance in 2007. As partially exciting as these preparations for someone else’s party may seem, I can’t help feeling a little peeved by the sudden influx of new faces to the hotel. That’s no judgement on the hotel staff who have proved that their continued sense of priority is to their existing guests. It’s perhaps more that this year more than ever before I’ve found myself totally relaxed, totally immersed in the laid back atmosphere. So much so that when other people break into the bubble it takes a little getting used to. It will be very difficult to resist not booking ourselves in for another two weeks when we check out later on, but for now I’m really quite relieved we’re on our way home.